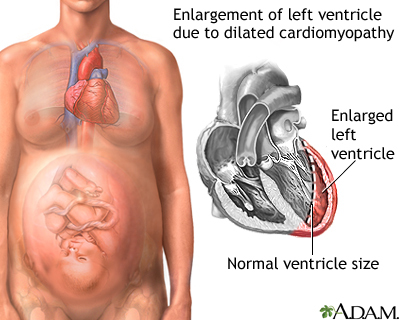 Peripartum cardiomyopathy is a rare disorder in which a pregnant woman's heart becomes weakened and enlarged. It develops during the last month of pregnancy, or within 5 months after the baby is born. Cardiomyopathy occurs when there is damage to the heart. As a result, the heart muscle becomes weak and does not pump well. This affects the lungs, liver, and other body systems. Peripartum cardiomyopathy is a form of dilated cardiomyopathy in which no other cause of heart weakening can be found. It may occur in childbearing women of any age, but it is most common after age 30. During a physical exam, the health care provider will look for signs of fluid in the lungs by touching and tapping with the fingers. A stethoscope will be used to listen for lung crackles, a rapid heart rate, or abnormal heart sounds. The liver may be enlarged and neck veins may be swollen. Blood pressure may be low or may drop when standing up. A heart biopsy may help determine if the underlying cause of cardiomyopathy is a heart muscle infection (myocarditis). However, this procedure is not done very often. A woman may need to stay in the hospital until acute symptoms subside. Because it is very often possible to restore heart function, and the women who have this condition are often young and otherwise healthy, care is often aggressive. For most women, however, treatment mainly focuses on relieving the symptoms. Some symptoms go away on their own without treatment. A low-salt diet may be recommended. Fluid may be restricted in some cases. Activities, including nursing the baby, may be limited when symptoms develop. Daily weighing may be recommended. A weight gain of 3 to 4 pounds (1.5 to 2 kilograms) or more over 1 or 2 days may be a sign of fluid buildup. Women who smoke and drink alcohol will be advised to stop, since these habits may make the symptoms worse. There are several possible outcomes in peripartum cardiomyopathy. Some women remain stable for long periods, while others get worse slowly. Others get worse very quickly and may be candidates for a heart transplant. About 4% of people will require heart transplantation and 9% may die suddenly or die from complications of the procedure. The outlook is good when a woman's heart returns to normal after the baby is born. If the heart remains abnormal, future pregnancies may result in heart failure. It is not known how to predict who will recover and who will develop severe heart failure. Up to about one half of women will recover completely. Women who develop peripartum cardiomyopathy are at high risk of developing the same problem with future pregnancies. The rate of recurrence is about 30%. Therefore, women who have had this condition should discuss birth control methods with their provider. Call your provider if you are currently pregnant or have recently delivered a baby and think you may have signs of cardiomyopathy. Get medical help right away if you develop chest pain, palpitations, faintness, or other new or unexplained symptoms. Eat a well-balanced diet and get regular exercise to help keep your heart strong. Avoid cigarettes and alcohol. Your provider may advise you to avoid getting pregnant again if you have had heart failure during a previous pregnancy. Silversides CK, Warnes CA. Pregnancy and heart disease. In: Zipes DP, Libby P, Bonow RO, Mann DL, Tomaselli GF, Braunwald E, eds. Braunwald's Heart Disease: A Textbook of Cardiovascular Medicine. 11th ed. Philadelphia, PA: Elsevier; 2019:chap 90.